Linda Gorens-Levy, Mayor Tom Barrett, Dan Katt and David Dupee. Photo taken July 26th, 2018 by Jeramey Jannene. 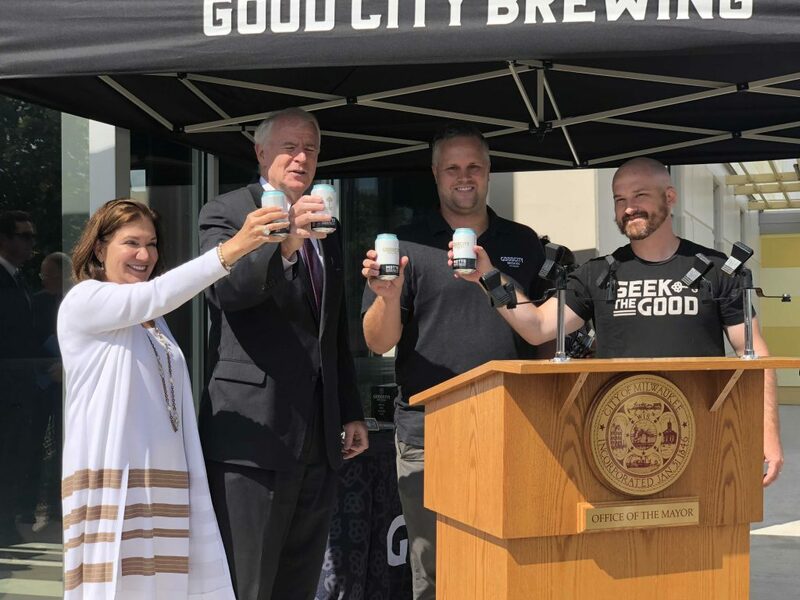 “From my perspective, this is the most important step we have taken to move Century City forward,” proclaimed Mayor Tom Barrett at a press conference announcing Good City Brewing’s acquisition of the Century City I industrial building at the southwest corner of N. 31st St. and W. Capitol Dr.
Good City will relocate its office and warehouse operations, moving from its N. Farwell Ave. location to the Century City building. 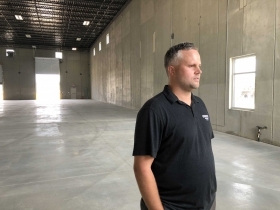 The company hopes to use the building to brew beer within two years as it continues to expand. 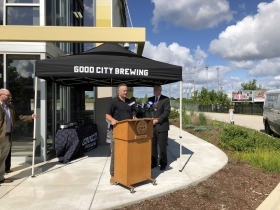 The fast-growing brewery opened in June 2016, and announced a second taproom and small brewery for the entertainment center across from the new Milwaukee Bucks arena last month. Having expanded a number of times within its current space, including opening a hall and rooftop deck, the company has been looking for more space since this spring. “When we open up the brewery every morning we are moving stuff into the parking lot and moving it back in at night,” said co-founder Dan Katt. The company examined a number of options for additional capacity, including the closed auto body shop across the street from the east side brewery and taproom said Katt. Good City will employ six to as many as 10 office employees and up to four warehouse workers when it first opens in the Capitol Dr. building, Katt said. The brewery will not need all of the space in the 51,160 square-foot building, at least not right away. So Katt says he is leveraging his background in real estate to find tenants for the north half of the building. ”We know that there are a lot of people that are like minded and we want them to come join us here at Century City,” said Katt. The brewer said the nearby neighborhoods will provide a workforce not just for the warehouse, but for the company’s other locations as well. 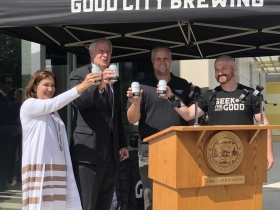 Katt, who leads the brewery with co-founders David Dupee and Andy Jones, told Urban Milwaukee the brewery plans to move in quickly. The plan is to close on the building in October pending city approvals. The building, developed by General Capital Group in 2016, was the first new building built in Century City. The area was formerly home to Tower Automotive and commonly known as the 30th Street Corridor. 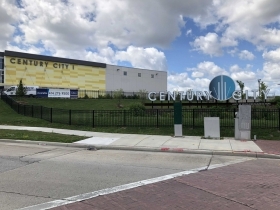 The city hopes to find the same success in redeveloping the area as it did with the Menomonee Valley, but the effort has gone more slowly and has been far more challenging. ”We don’t think we could ask for a better anchor here,” said Department of City Development Commissioner Rocky Marcoux. The area has yet to find many permanent tenants. 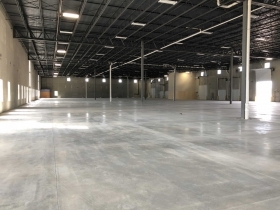 Talgo leased space in a former Tower Automotive building to assemble high-speed rail train sets for Wisconsin, Oregon and Washington, but closed after that work was completed. The company recently reopened with the announcement of a contract to rebuild subway cars for Los Angeles. Northwestern Mutual contractors Benson Industries and Duwe Metal Products leased 83,000 square feet of space next to Talgo to build the glass panels for the insurance company’s new downtown tower. That space is now empty. 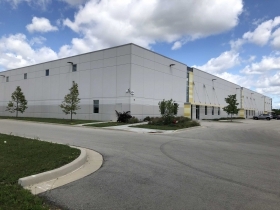 In the building Good City is buying, a basketball court builder leased space temporarily for the assembly and finishing of two new courts for the Milwaukee Bucks’ new arena. Great promises for real jobs. So many have criminal backgrounds or are on probation would you think about giving a second chance to these people ? The article said the building is on the NORTHWEST corner of 31st and Capitol. Isn’t the building (and all of Century City) actually SOUTH of Capitol?? This is the same area where Milwaukee Mayor Tom Barrett is begging Amazon to build a distribution Center that would hire 2000 people.Now why would Amazon want to locate a distribution center here when they have better freeway access in Oak Creek?And also does Mayor Barrett think he can lure Amazon to this location without tax breaks?As far as the surrounding neighborhoods with crime concerns?Back in the day when this was A.O. Smith that had over 4,000 people working here into the 1980s,a friend of mine worked here had his car broken into several times. I’ve had my car broken into several times in the suburbs! Imagine that. You sure are negative and seem like an unpleasant person Steve. There are advantages to the city. Why did this company move there? Why shouldn’t Barrett pursue Amazon? Go back to Breitbart. @PMD I as a Milwaukee resident who lives on the southwest side love a lot of the things Milwaukee has to offer.I ride my bike into downtown and watched the progress of the Bucks new Arena.Never in my last sentence did I ever say car break ins happen only in Milwaukee and not in the Suburbs.I am fully aware of car break ins Metro wide.And no I don’t listen to breitbart but do listen to the AM Radio dial and read Urban Milwaukee for balance.I am however frustrated with the leadership of Milwaukee that is pushing for a form of Transportation that is too inflexible and focusing too much attention on downtown while many other great Milwaukee neighborhoods are falling in the wrong direction.I support a Bus Rapid Transit System to bring employees out to areas where there is a shortage of workers.The Mayor Of Brookfield likes the idea after reading a portion of the story from the Milwaukee Business Journal.